curried brioche french-toad, originally uploaded by aarn! +13th February, 2010+. beat an egg and mixed in a pinch of coriander-heavy curry powder, a pinch of cayenne pepper, some mustard powder, salt, and orange zest. beat until the spices were well mixed and then added 1c. of coconut milk and a splash of whole milk. cut some one-inch thick slices of iggy's brioche loaf (sherman market) and soaked them in the seasoned mixture until almost fully-soggy. used a small glass to cut out circular regions in the slices of loaf. placed the slices in a hot skillet with a little butter and olive oil, allowed to sear for a second and then dropped an egg in the hole on each slice. cooked until bread was nicely browned, then flipped and cooked until finished. 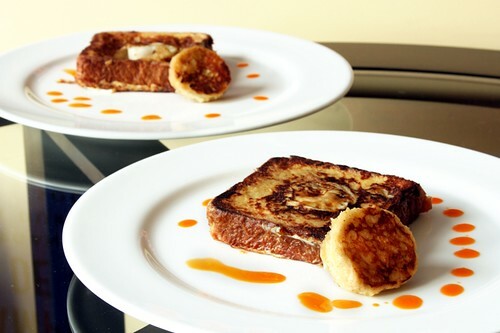 another option would have been to use thicker slices, sear them off the same way, and then finish them in the oven (the go-to french toast technique). plated up with the fried center pieces that had been previously removed and a drizzle of paprika oil. This is pretty sharp. I love how your recipe is composed in the past tense, I think that keeps it humble. Those brioche loaves come from B&R bakery by the way. Also, I wonder if it'd be possible to treat the cut-out bread pieces in a totally different way, like soak them in something entirely separate before putting them back on the plate. Thinking of a cherrry on a sundae, I wonder if you could soak them in grenadine or something dumb like that.